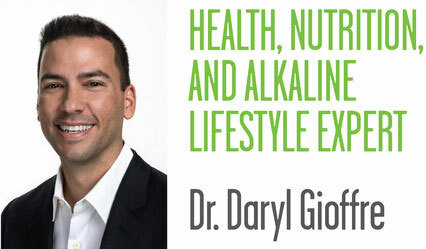 Dr. Daryl Gioffre is a celebrity nutritionist and longevity expert who specializes in the alkaline diet. A former sugar addict turned health machine, Dr. Gioffre knows firsthand what it takes to overcome adversity and challenges in your health. His specialty is uncovering the root causes of inflammation and chronic illness (ACID! ), using a comprehensive, yet simple, seven-step plan to make healthy changes more convenient and sustainable. His approach is one of moderation, not deprivation, and uses cutting-edge nutrition to help you achieve and maintain an optimal level of health and energy. As the founder of the Gioffre Chiropractic Wellness Center and Alkamind, he is a board-certified chiropractor in the state of New York (17 years). Dr. Gioffre is a passionate speaker and educator, certified raw food chef, live blood microscopist, reiki master, and ultra-marathoner. He is the author of GET OFF YOUR ACID – 7 Steps in 7 Days to Lose Weight, Fight Inflammation, and Reclaim Your Health & Energy – which launches January 9, 2018, published by the Hachette Book Group (division of Dacapo). It was during his initial years in practice that Dr. Daryl noticed his patients were split into two groups, which would lead him to a life-changing realization. One, smaller group of patients were under wellness care, having gotten healthy and focusing on maintaining their well-being. The other, larger group was like most of the world — sick, tired, overweight, and experiencing sleep and digestive problems. Seeing these differences led Dr. Daryl to uncover the concept of acidity and the stress it puts on the body. With an alkaline diet, some of his patients were seeing incredible results. He developed an alkaline diet, later founding the Alkamind™ program to assist people in detoxification and proper nutrition.